It is time to release another version of Position Size Calculator indicator. It has some important bugs fixed and also adds new exciting features, including two new tabs. The complete list of changes is provided below. The Balance button on the Main tab now has a third state: Balance − CPR. It shows the current account balance less the current portfolio risk (taken from the Risk tab). It can be useful when you want to consider your potential before calculating the size of the next position. This feature was suggested by Alfredo. New tab with all the info about swaps for the current trading instrument. All the data is calculated on per lot and per position size basis, also, as daily and yearly values (year = 360 days). This example shows a rather simple case when swaps on Gold are charged in base currency, which coincides with the account currency. New tab with controls for trading script (PSC-Trader). This adds two advantages: first, you no longer have to modify script’s code when you want to change some simple thing, like slippage for example; second, you can have different options saved for different currency pairs and use the same compiled script to trade them. This feature was suggested by Andy. Added an input parameter (PanelOnTopOfChart), which can be set to false to expose the chart behind the panel. This will be particularly useful if you use small chart windows. Fixed a bug when a take-profit line would appear on top of panel on a take-profit button click. Now, the line will show up on background — as the other lines do. Fixed a bug that prevented normal change of input parameters. The panel will no longer stop working if you change inputs or recompile it while it is running on a chart. Fixed a bug in MT4 version of the calculator that caused incorrect margin calculation when custom leverage was set. MT4 version has also been optimized for speed with less MarketInfo() calls. 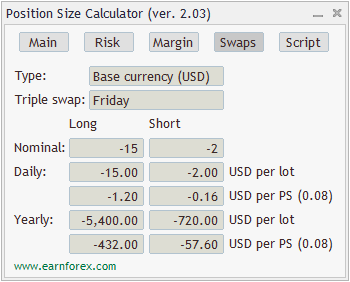 If you prefer not to use MetaTrader, you can still use the web version of the position size calculator. Unfortunately, it lacks the most interesting features of the MetaTrader version. If you have any suggestions or wish to report a bug for this MetaTrader indicator, please do so using the commentary form below. 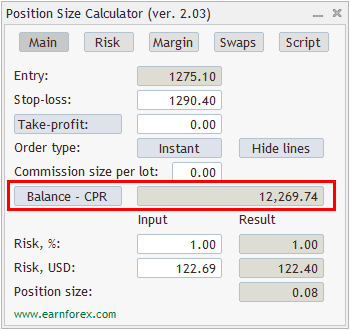 Position Size Calculator indicator is best for trading. Thanks a lot for share it.